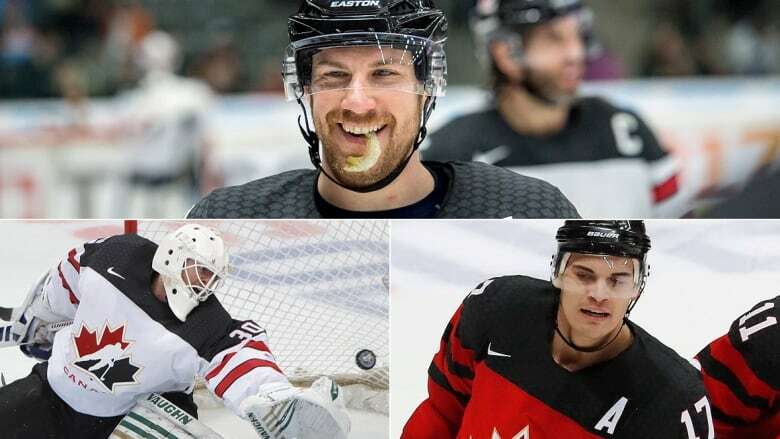 Former Calgary Flames forward Rene Bourque, ex-Vancouver Canucks and Edmonton Oilers centre Derek Roy and long ago Toronto Maple Leafs goalie Ben Scrivens will try to make like their former NHL brethren and win a gold medal for Team Canada at next month's Olympics in Pyeongchang. The 14 forwards, eight defencemen and three goaltenders join Team Canada from seven different leagues across North America and Europe seeking a third consecutive Olympic title. Of the 25 players, 13 play in Russia's Kontintenal Hockey League, while others were plucked from the American Hockey League and European teams. "It has been an exciting journey to arrive at this 25-player roster," general manager Sean Burke said in a statement released by Hockey Canada. "We have a very special group of talented players and staff who are ready to compete in South Korea." Burke and his management team were tasked with forming a player roster minus the likes of Sidney Crosby, Connor McDavid and Carey Price after NHL commissioner Gary Bettman pulled the plug on NHL participation in South Korea last May. Bettman had said the cost was "many, many, many millions of dollars," and doubted NHL team owners would pay for the "privilege of disrupting our season." It will mark the first time since 1994 that NHL players won't be at the Winter Olympics. However, International Ice Hockey Federation president Rene Fasel has already begun his push to have the best hockey players in the world at the 2022 Games in Beijing. Canada tasted gold in Vancouver in 2010 and in Sochi, Russia, four years ago with squads littered with NHL stars. For the 2018 team, Hockey Canada brass used three pre-Olympic European tournaments — the Karjala Cup, Channel One Cup and Spengler Cup, to evaluate potential players. "These guys … they earned it," Burke said. "We've been able to give a lot of players across Canada an opportunity to make this team and what I feel best about is that we've seen our players numerous times. I don't think you could say we missed anybody." Twenty-one of Canada's players have appeared in at least one NHL game, with former Senators forward Chris Kelly leading the way with 833 regular-season contests. A 2011 Stanley Cup champion with the Boston Bruins, the 37-year-old amassed 123 NHL goals and 289 points, and is currently on a player tryout contract with Belleville of the AHL. Roy, 34, played 738 regular-season contests over 11 seasons, including eight with Buffalo. The Ottawa native scored 189 goals, including a career-high 32 in the 2007-08 season, and 524 points before leaving the NHL following the 2014-2015 campaign with Edmonton. Roy posted 11 goals and 22 points in 46 games during his lone season with the Oilers, a far cry from the 81 points he racked up as a solid playmaker for the Sabres in 2007-08. He wowed KHL fans a year ago on a pretty individual effort while a member of Chelyabinsk Traktor. This season, Roy has 24 points in 29 games with Linkopings HC of the Swedish Hockey League, Roy's fourth team in the past three seasons. Bourque, 36, signed with Djurgardens IF of the Swedish league last August and has 13 goals, 21 points and a plus-11 rating in 31 contests after collecting 163 goals and 316 points in 725 regular-season games in 12 NHL seasons. He had trouble regaining his offensive form with Anaheim, Columbus, Colorado and Montreal after being dealt to the Canadiens in January 2012. The 31-year-old Scrivens joins the Canadian squad from Ufa Salavat Yulayev of the KHL, with whom he has played 35 games this season, compiling a 19-11-2 record, 2.29 goals-against average, .917 save percentage and four shutouts. The Spruce Grove, Alta., native last appeared in the NHL in 2015-16 with Montreal, where Scrivens went 5-8-0 with a 3.07 GAA and .906 save percentage in 15 outings before the Canadiens waived him. Scrivens notched seven shutouts in 144 regular-season games but never appeared in the playoffs. "This team proves the depth of Canadian hockey," said Team Canada chef de mission Isabelle Charest. "All of Canada will rally behind this team as it sets out to show the world that we will always be a force to be reckoned with on the ice." Winger Mason Raymond, who scored 25 goals with Vancouver in 2009-10, former Canadiens and Canucks' superpest Maxim Lapierre (586 penalty minutes in 614 games), one-time NHL prospects Gilbert Brulé (Columbus) and Wojtek Wolski (Colorado) and former Canucks role player Linden Vey are among the other notable players on a Canadian outfit with more than 5,500 NHL games under its belt. In October 2016, Wolski suffered two broken cervical vertebrae, spinal cord trauma and a concussion when he crashed headfirst into the boards during a KHL game. "All of our players, at somewhere along the line, they've been told, 'No,"' Canada head coach Willie Desjardins said. "They're not going to get a chance to continue their NHL career or even start it in some way. They've stuck with it, they won't give up. Our team is about guys who have received a no but found a way to make a yes." Desjardins singled out the strong work ethic of Brandon Kozun that earned the five-foot-eight, 167-pound right-winger a spot on the team. "He was a top-five player the last two years in the KHL [with Yaroslavl Lokomotiv]. We thought for sure he'd be on the team and he comes in and things don't go well the first tournament," the former Canucks bench boss recalled. "He's supposed to be a scorer and he's not scoring. What does he do? He finds another way to make the team. "The last tournament he worked so hard, he wouldn't accept not making [the Olympic team]. He hit everybody. He just wanted to make this team." The blue-line is less experienced with Cody Goloubef leading the way with 129 NHL games. Defencemen Chris Lee and Mat Robinson have not played in the NHL while Chay Genoway has one game and Maxime Noreau six. The 12-nation men's tournament runs Feb. 14-25 at the Gangneung Hockey Centre and the Kwandong Hockey Centre. Canada's training camp starts Jan. 28 in Latvia, with exhibition games in Riga on Feb. 4 against Latvia and Feb. 6 against Belarus. The team will then fly to Pyeongchang and take part in the opening ceremonies before facing Sweden in a warmup game in Incheon on Feb. 12. Canada, which has won nine gold and 13 medals overall since the inaugural Winter Games tourney at Antwerp, Belgium, in 1920, opens its title defence Feb. 15 against Switzerland at Kwandong Hockey Centre.